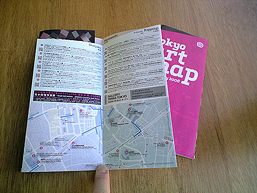 Please make the most of our new bilingual art map that introduces a selection of events happening in Tokyo. Since its launch in October 2004, TAB has published information on more than 18,000 events. That’s more than 400 events a month. Who’d have thought there were that many art & design events happening in Tokyo each month?! 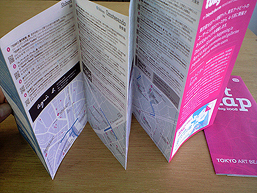 We recently decided to take a selection of those events and publish them every 2 months on a printed map. We are hoping to make it easier for people to navigate the city in their search for exhibitions. This map will also allows us to reach a broader audience, driving new traffic to the venues and our website. The first issue (April-May) features 50 events grouped in 7 areas: Ginza, Kyobashi, Ueno, Roppongi, Shinjuku, Omotesando and Shibuya. On each panel you will find 5 to 6 event details (title, short event description, schedule details) and a small map indicating the location of the venues. 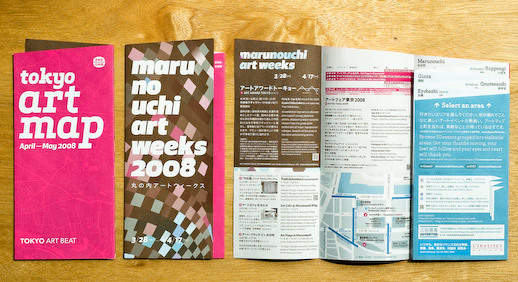 In addition, a special section highlights the “Art Week” events happening in the Marunouchi area: Marunouchi Art Weeks, Art Fair Tokyo, New Tokyo Contemporaries, and so on.The 50 locations (museums, galleries, shops and cafes) were selected from a list of the most popular venues among TAB users (combining recommendations on MyTAB and page views)! It is so exciting to see users recommending events to other users. These maps are FREE! 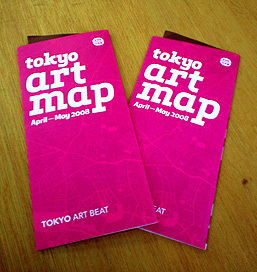 !We have printed 100,000 and they are currently distributed in more than 120 locations for this first issue (the 50 venues featured on the map, 34 art and design colleges in the Tokyo area, all the agnès b. stores in Tokyo and a host of other venues) and we are working on distributing our last 10,000 in a selection of cafés, design shops and bookstores in Tokyo. The secret plan is to print and distribute 1,000,000 of each issue… Can we get there within one year? The first issue was supported by Mitsubishi-jisho and 8 other advertisers.